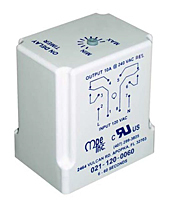 MPE Time Delay Relays - B&M Technical Services, Inc. The 021 timer offers a delay on operate function. The timing range is user specified up to one hour. The timer can be manually set to any time within the selected range. Timing is initiated by application of power to the timer. Upon completion of the timing cycle, the output relay will energize.